In Koko-Di Koko-Da, Swedish director Johannes Nyholm (The Giant) explores the disorienting pain of grief via a series of surreal nightmares. It's a quirky, mirth-making journey, to be sure, but don't expect to have very much fun. 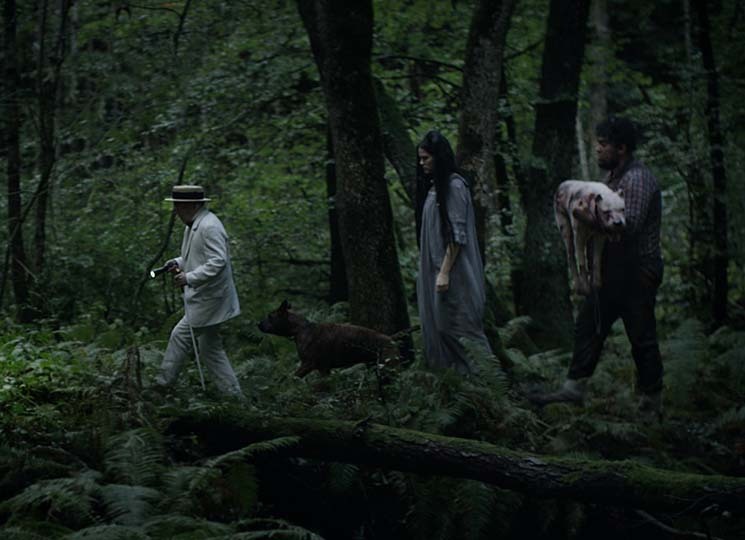 Following the death of their child, Elin and Tobias (Ylva Gallon and Leif Edlund Johansson) embark on a camping trip in the forest. As revealed in the film's opening shot, they're continuously harassed by a group of circus-like vagabonds who emerged from a haunted music box. This includes an elderly man with a top hat and cane, as well as a ridiculous unibrow-bestowed stooge who carries a dead animal with him everywhere he goes. There's a lot of good in the film, but unfortunately most of it lies in the moments of realism. Elin and Tobias's strained relationship is darkly comic in its believability, their bickering, tension and bruised egos brimming with ample awkwardness thanks to Nyholm's fantastic direction. Unfortunately, those moments are brief distractions from the music box circus performers, whose haunting antics are more silly than sinister. Since the film's dream-like state is built around constant interruptions from this group, the film started to feel tedious by the third act.